Robin Bush’s new book “Strategic Dreams” is an interactive resource for deciphering dreams and their spiritual connotations. Recent release “Strategic Dreams” from Page Publishing author Robin Bush is a guide to the interpretation of dreams and a journal for readers to record their own. Robin Bush, a minister at House of David Apostolic Temple in Fort Worth, Texas who currently serves as vice president at Future Hope and Healing Center for survivors of domestic violence, has completed her book “Strategic Dreams”: a thought-provoking work exploring the meaning of these unconscious visions and encouraging readers to delve deeply into their spiritual intentions. Bush writes, “Not everyone has a dream, but everyone who has a dream wants to know what it means! This book helps you get to the meaning in a way that has YOUR signature on it. Many dreams are personal and have their own signature, a language all its own. Find your signature and find out what your dreams are saying to you. This book is simple in nature but powerful in application. It is designed to take with you and refer to when you need it. To guide you into that meaning and interpretation in a way that cause you to know you are doing all you can do to get to the right road, to be the best you can be! Published by New York City-based Page Publishing, Robin Bush’s book is an invaluable resource for readers interested in the meaning and interpretation of dreams. 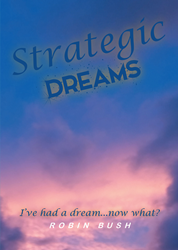 Readers who wish to experience this engaging work can purchase “Strategic Dreams” at bookstores everywhere, or online at the Apple iTunes store, Amazon, Google Play, or Barnes and Noble.